Justis Fearsson is a weremyste. He wields powerful magic that helps him in his work as a private detective. But each month, as the moon waxes full, he loses control of his sorcery and of his mind. Eventually he will wind up insane, just as his father did. Right now, though, Fearsson has a serial killer to catch. The Blind Angel Murders were the biggest case he worked while in the homicide department of the Phoenix Police Department. Even then he knew that the killer was a myste, just like him. Still, the killer eluded him and everyone else. The Blind Angel’s latest victim is the daughter of the most powerful politician in the state, and finally Fearsson has a lead. But the police don’t like it when disgraced ex-cops hone in on their investigations. And the Blind Angel murderer is the most powerful and cunning sorcerer Fearsson has ever faced. Now what began as an investigation has become a hunt, and with the moon waxing full again, and his mind beginning to slip, Fearsson no longer knows if he is hunter or prey . 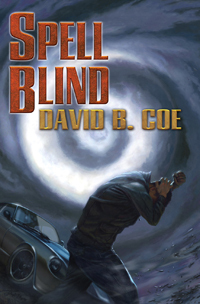 . .
Read sample chapters of SPELL BLIND, book 1 of the Case Files of Justis Fearsson.